mods:extent 1 engraving; 39.6 x 23 cm. 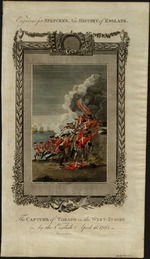 mods:abstract Hand-colored engraving by Scott for Spencer's New History of England, in ornamental border; British troops landing and storming over stone wall of fort, ships anchored in background. mods:note Narrow upright medium folio, matted; margins intact; foxed. provenance London, Spencer, '53. DGs.